UPDATE: This paper has now been published and is getting great press attention, including features in the New York times. At our recent LCOGT journal club one of my colleagues introduced me to a paper on ArXiv about a supernova in a distant galaxy. I was busy that day and wasn't going to go, but it was just intriguing enough to persuade me. It didn't disappoint. All of the blobs in this image are galaxies, the only stars (which are in the foreground as we look through our own galaxy) are the ones which look like...er...stars (i.e. with spikes coming out of them). In galaxy clusters there is always a brightest galaxy and this is often at the centre of the cluster called the Brightest Cluster Galaxy (BCG). Just to the lower right is a bluish spiral galaxy, which looks like it has an orange blog growing out of it. This is the galaxy we're intersted in. Does that galaxy look familiar to you? In the image below I've circled the galaxy I mentioned and another interesting galaxy that looks very similar to it. Actually, there is a pretty good reason that it looks so similar. It is the same galaxy. Actually neither of these galaxies is the real galaxy. The real one is directly behind the BCG. The reason we can see it is because of an effect called gravitional lensing. This when space is warped by something really massive (in this case, the BCG) so that light doesn't travel in a straight line any more. That is how we can see in this picture, what we call 'images' of the original galaxy. Instead of all the light from that spiral galaxy coming towards us from the direction, because space is warped around the BCG we see a few ghostly versions appearing all around the picture (ther are more version of this spiral than just those 2!). That is weird enough in itself but it gets weirder. In some recent observations taken with the Hubble Space Telescope, the two versions of this spiral galaxy are different. The one on the lower right has a supernova explosion in it, while in the left image of exactly the same object, there isn't one! This happens because of 2 crazy effects. First, because of the warping of space there is difference in the distance the light has to travel when it goes around the BCG to get to us. Second, because of the intense gravitational pull of all the galaxies in this cluster the strange effects Einstein's General Relativity are slowing down time for one of the images a little bit. That means the although the supernova has exploded in the original galaxy (which is hiddien by the BCG) the 2 versions we can see are out of sync probably by up to 10 years. The crazy doesn't stop there! You can see in the lower right image there is a big yellow blob embedded in there. This is not the supernova, this is another galaxy which it warping the image of the spiral galaxy even more. Below is a close up of that, where you can see 4 faint dots arranged in a cross shape. These dots are the supernova. 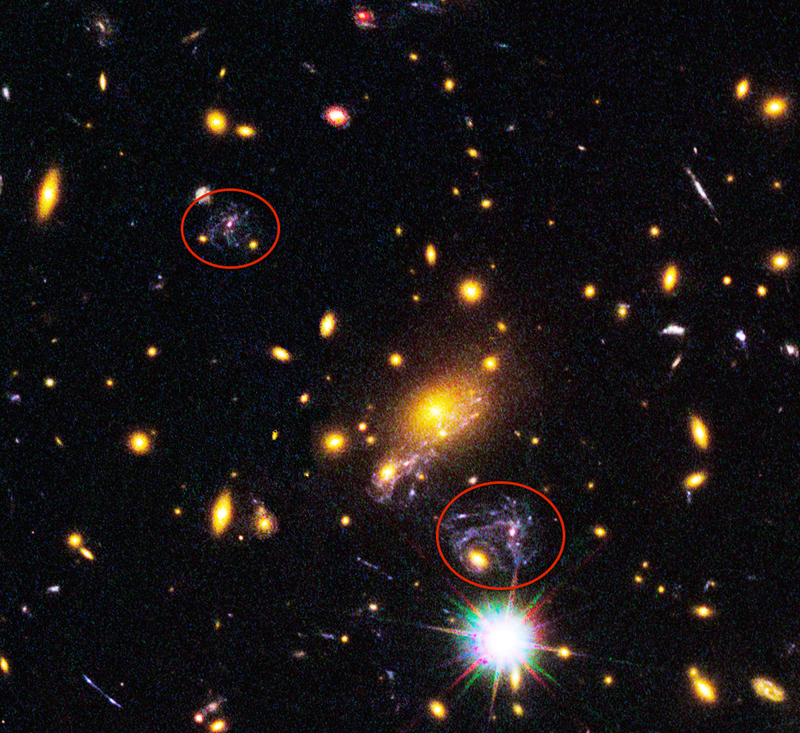 Again each of these dots is an image of the supernova which should be totally hidden by that yellow blob galaxy. The mass of the blob galaxy is warping space making another gravitational lens. 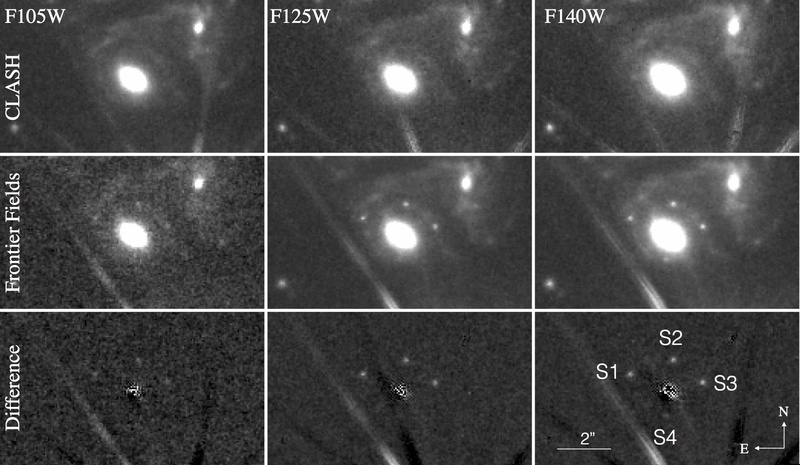 Like the lens images of the spiral galaxy itself, the supernova images are also out of sync with each other: Each of those images is showing the supernova in a different time epoch of the explosion! You really can't get any more sci-fi than that! The really interesting part is that astronomers will get to see this supernova change over time, as well as having early warning that a supernova is going to occur! If you want to read the full science results have a look at the paper on ArXiv.